Home Blog Need Help in a Hurry? Turn to Our Lady of Prompt Succor! Need Help in a Hurry? Turn to Our Lady of Prompt Succor! I have just the thing for you. Rather, I have just the someone for you. Our Lady of Prompt Succor, whose solemnity is celebrated today in the Roman Catholic Church. That’s the title given to our Blessed Mother in France in 1810 by Ursuline Sister, Mother St. Michael Gensoul. Mother St. Michael’s fellow Ursulines in Louisiana (United States) were in crisis and desperately needed more nuns to help them out. But… only the Holy Father could grant permission for a group of Ursulines to be transferred, and he had been imprisoned by Napoleon as part of the emperor’s anti-Catholic campaign! The Pope did indeed receive the letter, and was able to respond. By the end of December, Mother St. Michael and a group of Ursulines were on their way to Louisiana. The brought with them the statue before which Mother St. Michael had prayed and from that time on, devotion to Our Lady of Prompt Succor grew and spread. In 1895, Pope Leo XIII granted permission for the solemn crowning of the statue, which was done by Archbishop Janssens on November 10 of that same year. The devotion was officially approved in Rome in 1912. 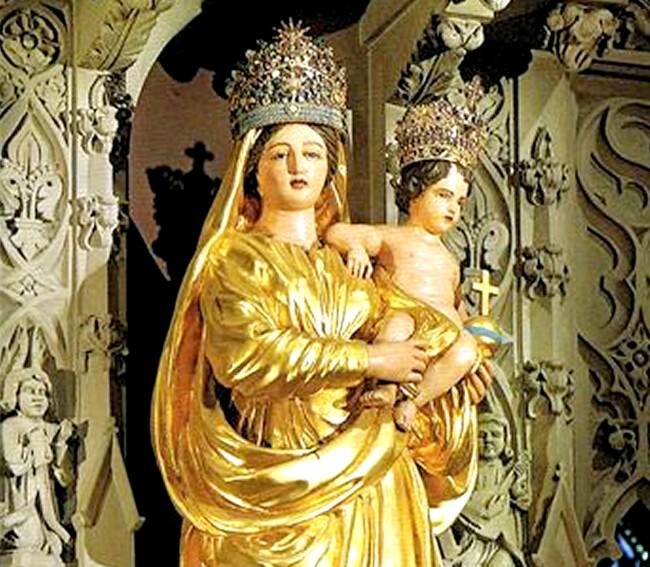 The statue now rests in the Shrine of Our Lady of Prompt Succor in New Orleans, Louisiana. You can learn more about the devotion as well as the shrine itself here. In fact, if you’re in the area, you may wish to participate in the festive Mass of Thanksgiving that will be held there at 4pm local time. Whether you can make it or not, perhaps you’d like to spend some time with Our Lady of Prompt Succor. She is intensely interested in your needs, and is eager to help. Here’s the link to the Litany of Our Lady of Prompt Succor, from the University of Dayton Mary Pages. I’ll be praying this beautiful litany today for my own intentions, but especially for yours. Blessed feast of Our Lady of Prompt Succor! Epiphany – Has the Lord Been Made Manifest to You?